May is not only known for Mother’s day, which is celebrated on the second Sunday of the month, but for the emerald, which is the spring month’s birthstone. The emerald is perfect for the springtime since the color green symbolizes the season along with growth and renewal. These gemstones display a radiant green tone, which has come to be known as emerald green. Just like other precious gemstones, emeralds vary in quality as well as in price. Unlike diamonds, emeralds are generally bought in larger sizes since its glow is more prominently seen in bigger stones. 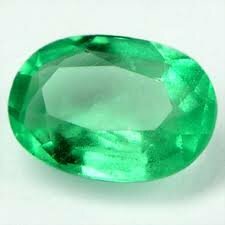 The emerald comes after the diamond in the order of birthstones, since the diamond is April’s birthstone, and perhaps this is no coincidence. The diamond may be a girl’s best friend, but an emerald can be her second best. With a remarkable color, a fascinating history and origin, the emerald is a gemstone worth holding onto. Derived from a combination of Greek and Old French, the name emerald means green gemstone. 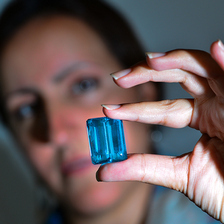 The Aztacs and Incas in South America, where emeralds are still found today, once considered the stone to be holy. Many years ago emeralds were found in Egypt as well, but those mines were done producing the gems long before they were discovered at the beginning of the 19th century. Emerald, like diamonds, are graded based on the 4 Cs: Color, Cut, Clarity, and in the case of emeralds, Crystal. 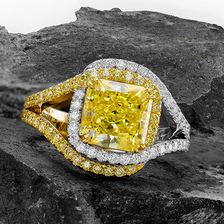 When it comes to colored gemstones, color is considered the most important factor. However, with emeralds, the crystal factor is a very close second. In addition to having a rich green hue, an emerald must posses a high level of transparency in order to be categorized as a desirable gem. Inclusions are not unusual for emeralds. For this reason, emeralds are not graded through magnification, but rather, by eye. If to the naked eye the emerald appears not to have any inclusions, the emerald is considered flawless. Stones without surface breaking fissures are extremely hard to find. That is why most emeralds are treated and oiled, to enhance their clarity. Most emeralds are shaped and polished and not faceted like other gemstones such as diamonds. Round Zambian Green Emerald gemstone and diamond ring mounted in 18K white gold. The center emerald weighs 0.54Ct. The shank is set with collection color white round brilliants 0.18Ct TW. Though the shades of green that emeralds exude are remarkable, they are not exclusively found in emeralds. 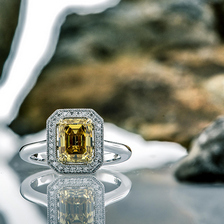 Other stones display rich green colors, including natural fancy green diamonds. Though rare, especially in large sizes, green diamonds are beautiful additions to any piece of jewelry or jewelry collection. 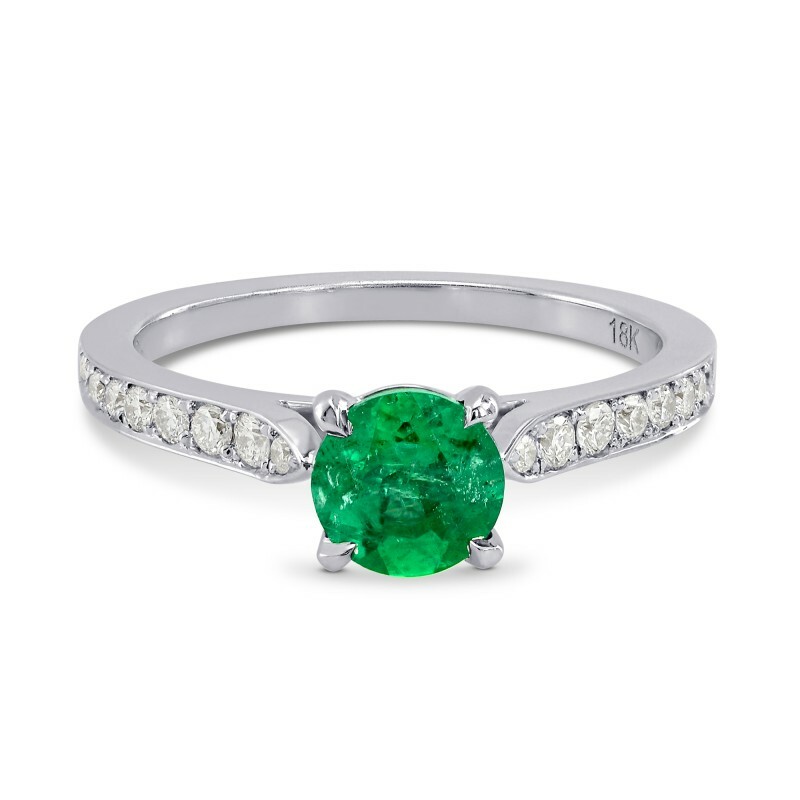 Emeralds also look lovely when combined with colorless diamonds on an appropriate setting. If May is the birth month of your loved one, you will have a fine selection of emerald jewelry to choose from.